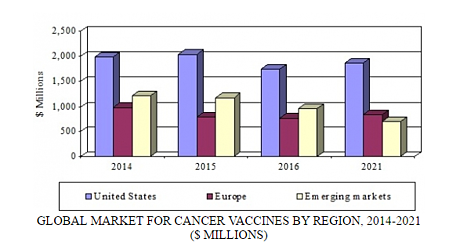 The increasing incidence of cancer, unavailability of efficacious treatments, and need to reduce the worldwide burden of this disease are driving the global market for cancer vaccines. Thanks to unique characteristics such as fewer side effects, low toxicity, and high specificity, cancer vaccines are considered an attractive and profitable domain. Cancer immunotherapy research incorporates a variety of technological approaches, including cancer vaccines, which are designed to promote tumor-specific immune responses. 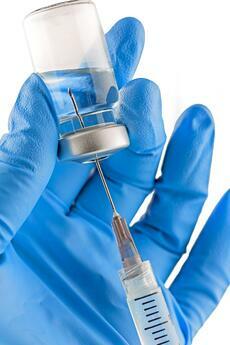 Indeed, cancer vaccines are attracting a lot of attention from a wide variety of players. Of Napster and Facebook fame, Sean Parker’s new $250 million cancer immunotherapy effort is embarking on a project that will focus on the discovery of highly personal tumor tags. The Parker Institute for Cancer Immunotherapy is teaming up with the Cancer Research Institute and 30 public and private entities to detect neoantigens, which could point researchers toward specific cancer vaccines. The effort marks the first major collaboration involving the Parker Institute and includes Genentech, Inc.; Personalis, Inc.; University of California, San Francisco; Amgen, Inc.; Bristol-Myers Squibb Co.; University of California, Los Angeles; University of Pennsylvania; Caltech; Broad Institute; as well as researchers in Italy, Singapore, Germany, and The Netherlands. Neoantigens are tumor-unique amino acid tags that arise as normal cells mutate into cancer. Neoantigens are antigens encoded by tumor-specific mutated genes and are immunologically active proteins that can help the immune system recognize the cancer cell as foreign and summon the body’s infection-fighting T cells. Neoantigens are ideal targets because they don’t show up in healthy tissue, thus limiting drug-related side effects. Researchers believe that vaccines could be produced for specific neoantigen signatures and prevent cancers from reemerging. Initially, the Parker Institute collaboration will focus on melanoma, colorectal cancer, and non–small-cell lung cancer, which appear to have larger numbers of mutations and thus more neoantigens. However, 1) neoantigens associated with one cancer may be different than those that emerge in another cancer, 2) populations of neoantigens change, and 3) one subset of neoantigens may be more important in a cancer’s development than another. This variability has led to difficulty in efficiently and cost-effectively producing vaccines for patients. To that end, the Parker Institute is launching a multipronged attack called the TESLA alliance. It will use Sage Bionetworks as an information broker for data generated by Personalis and another company sequencing the DNA and RNA in cancerous and healthy tissues. Sage will distribute that data to the TESLA network of approximately 30 academic and for-profit research centers. The participating centers will use their own algorithms to predict which neoantigens are present and will send their results to the Parker Institute to determine if they are correct. In turn, that information will be sent back to the researchers so that they can fine-tune their algorithms. As such, the Parker Institute hopes to create a system of sharing data to understand and evaluate potential neoantigen targets. The approach will produce better algorithms for predicting which neoantigens will be in each person’s cancer and which ones are more easily spotted by the immune system. CIMAvax is a therapeutic vaccine designed not to prevent cancer, but to halt its growth and to keep it from recurring in patients with non–small-cell lung cancer. Developed in Cuba, it works by targeting a protein called epidermal growth factor (EGF), which enables lung cancer cells to grow. CIMAvax stimulates the immune system to make antibodies that bind to EGF, preventing it from fueling the cancer’s growth. Recently, the Roswell Park Cancer Institute in Buffalo, NY received authorization from the US FDA to conduct a clinical trial of CIMAvax. Trials of the vaccine in Cuba have shown only a modest benefit overall. In the most recent trial, patients who received the vaccine after chemotherapy lived roughly three to five months longer than patients who did not receive it. The study, published in the journal Clinical Cancer Research, also found that vaccinated patients who had high concentrations of EGF in their blood survived even longer. Patients in Cuba began receiving the vaccine for free in 2011, and it has been administered to more than 4,000 patients worldwide, according to Roswell Park. Its proposed trial would combine CIMAvax with a form of immunotherapy called a checkpoint inhibitor, which prevents the cancer from turning off a patient’s immune system. The Roswell Park trial intends to use Opdivo (nivolumab), which is one of four checkpoint inhibitors approved by the FDA. The global market for cancer vaccines, valued at nearly $4.0 billion in 2015, is expected to decline from nearly $3.5 billion in 2016 to $3.4 billion in 2021, demonstrating a five-year compound annual growth rate (CAGR) of −0.4%. However, the US market should grow from $1.7 billion in 2016 to almost $1.9 billion in 2021 at a five-year CAGR of 1.4%. The European market is expected to total $777.4 million and $847.3 million in 2016 and 2021, respectively, reflecting a five-year CAGR of 1.7%. The emerging markets segment, with close to $1.2 billion in sales in 2015, is expected to total $713.1 million by 2021, a decline attributable to adverse event reports associated with human papillomavirus vaccinations. BCC Research’s new study, Cancer Vaccines: Technologies and Global Markets, analyzes diverse therapeutic platform technologies, immune-stimulating agents, and approved vaccines for cancer. Market dynamics—specifically growth and restriction factors, acquisitions and collaborations, and products in Phase I–IV clinical trials—are also examined. Global market drivers and trends, with data from 2015, estimates for 2016, and projections of CAGRs through 2021, are provided.